This mini series was kind of an interesting one. I’d originally planned to make a ten-part mini series called “Damania Review”, where the characters give sarcastic reviews of various films, games etc.. although this idea didn’t work out that well. Even so, I felt like I should make two mini series this month (the other one can be read here). 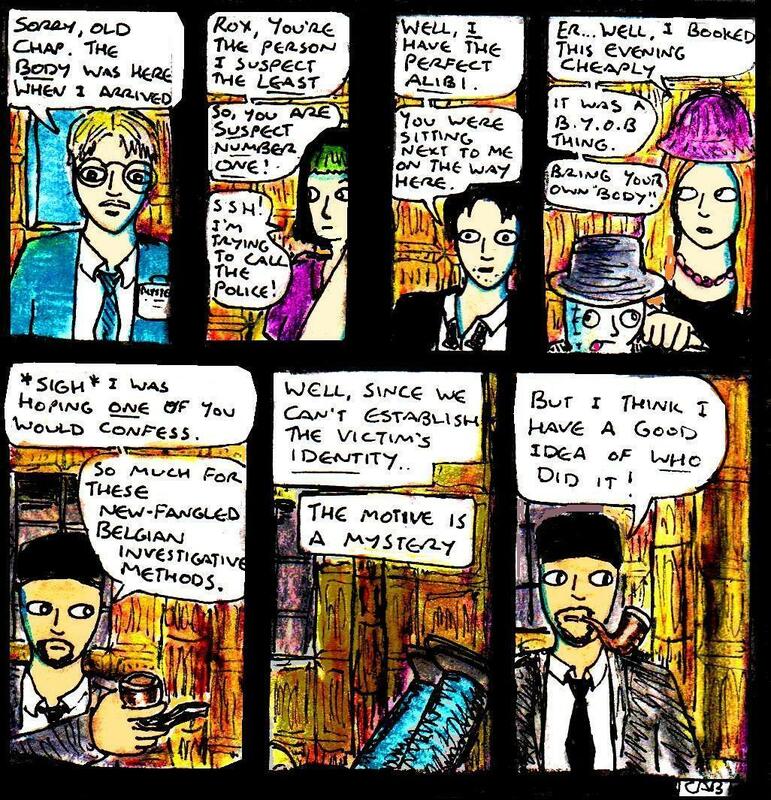 Since there were six days left in the month and since I’d watched a couple of series of “Poirot” on DVD a couple of weeks earlier, I wanted to make a “cosy” detective mystery comic. Surprisingly, making and planning this mini series was actually more challenging than usual, despite it’s shorter length (and a giant continuity error I’ve just noticed!). For example, the mini series was originally going to have a totally different ending (where the obvious suspect was the murderer). But, about two-thirds of the way through making the mini series, I suddenly thought of a much better and significantly funnier way to end the comic. Seriously, this mini series has one of the best endings I’ve written in a while. As usual, all six comic updates in this post are released under a Creative Commons BY-NC-ND licence. Likewise, you can click on each comic update to see a larger version of it if it’s too small to read here. If you want to see some of Harvey’s previous cases, then they can be found here, here and here. Links to many other comics featuring these characters can also be found here. 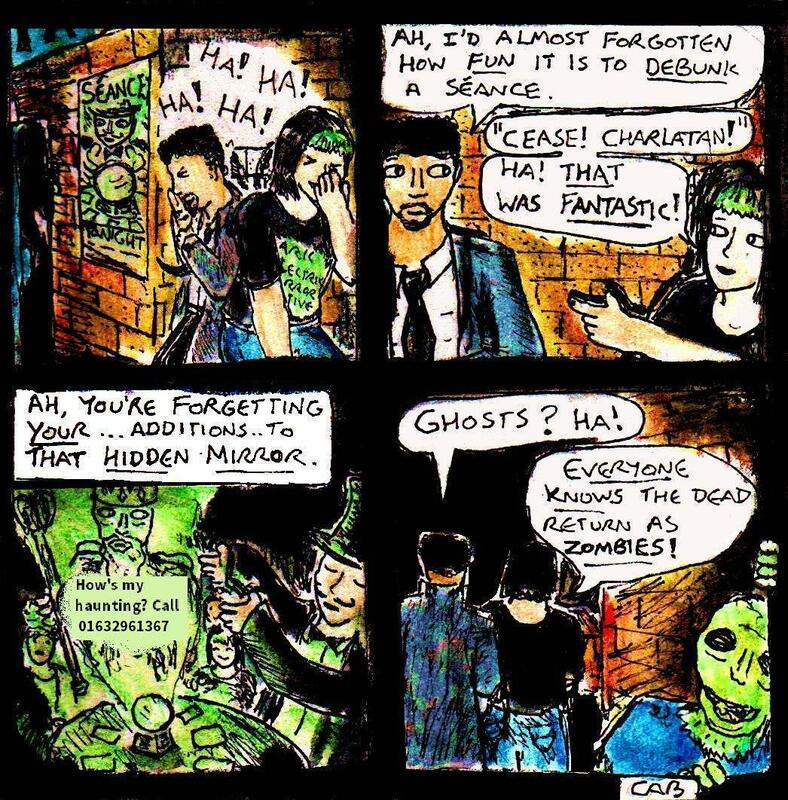 Yes, I know that this comic is a borderline breach of the series’ “No ghosts” rule, but well, it seemed like too funny of an ending not to include. 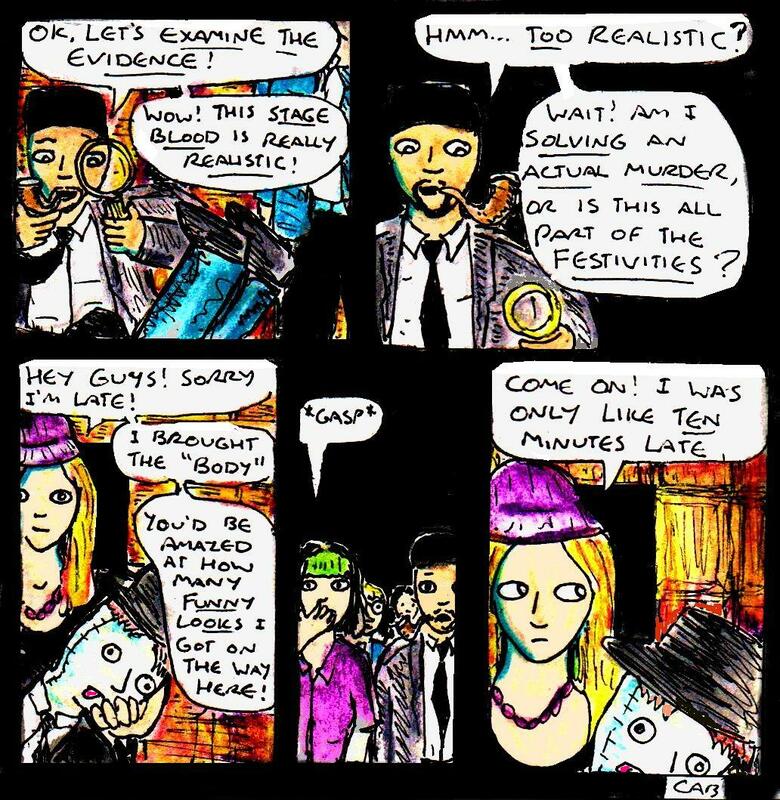 Especially when compared to my original plans for the ending (where the guy in the blue jacket from earlier in the comic was the murderer). Well, it’s the end of the month and that means that it’s time for my usual “Top Ten Articles” post. This is where I choose ten of my favourite articles about making art, making comics and/or writing fiction that I’ve posted here over the past month and link to them. As usual, there will probably also be a couple of honourable mentions too. All in all, whilst this month’s articles started out well, I had some mild writer’s block near the end of the month – so, there were a few badly-written and/or repetitive articles. Still, hopefully, this will pass. Woo hoo! 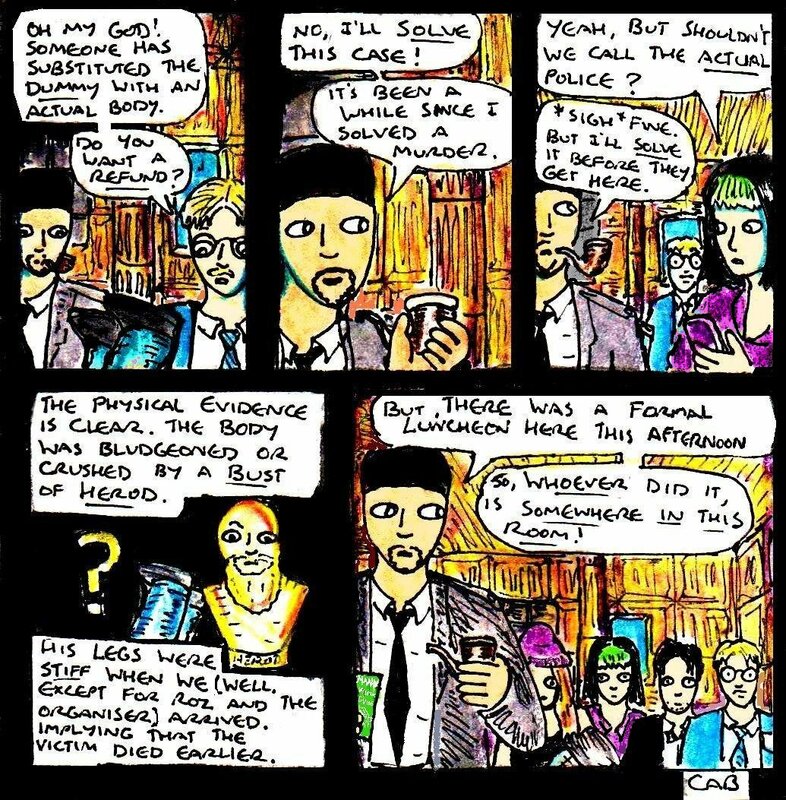 I am very proud to present the fifth instalment of “Damania Recovery” a (hopefully) six-part webcomic mini series, where Harvey gets to solve another case (albeit a traditional “cosy” mystery this time). If you’ve missed the previous parts, then they can be found here: Part One, Part Two, Part Three, Part Four. This probably isn’t for everyone, but I thought that I’d talk about something that I tend to do quite often when I’m making art. I am, of course, talking about watching DVDs in the background (usually whilst both listening via headphones and keeping the subtitles on, to avoid missing any of the dialogue). Again, this isn’t for everyone. Some people prefer to work in absolute silence, some people just like to listen to music and some people actually prefer to have other people in the general vicinity when making art. For me, solitude and non-interactive background things (eg: TV shows, music etc..) seem to work best. But, different things work for different people. Likewise, it’s only possible to do this if you make traditional (eg: completely non-digital) or semi-traditional art that mostly uses fairly portable materials. For example, whilst I heavily edit/process most of my art on the computer after I’ve scanned it, the actual drawing (and painting, using watercolour pencils) usually takes place in a sketchbook that is resting on my knee whilst I’m watching DVDs on my computer. But, what are the advantages of watching DVDs whilst making art? 1) Time limits: If you’re making art regularly, then it’s often good to set yourself time limits. If you can make a fairly decent painting or drawing within 1-2 hours, then this level of efficiency is probably going to help you out when you’re making more time-intensive things, like comics projects. In addition to this, setting a time limit also means that you’ll quickly learn to actually finish most of the pieces of art that you start making. It stops you from turning into a perfectionist who never finishes anything. And, if you’re watching TV shows (or possibly shorter films) on DVD whilst you’re making art, then it’s a lot easier to set a time limit. After all, you can tell yourself that you’re going to finish your artwork within the time it takes you to watch 1-2 episodes of a TV show, or one 90 minute film. This can also sometimes (but not always) help you to prevent yourself from binge-watching your DVDs too. 2) Physicality And Ritual: This might just be my traditionalist side, but there’s something good about the actual physicality of using a DVD (rather than just watching modern streaming video). Since making semi-traditional art is often at least a slightly physical experience, it just feels right that the things in the background should also share this quality too. I mean, if computers could play VHS tapes, then this would be even better. But, they can’t, so DVDs are a good substitute. In addition to this, actually getting the DVD out of it’s case and putting it in your computer can add an interesting element of ritual to the whole experience too. The only downside is the other ritual of replacing the DVD drive every couple of years…. Whilst every artist probably has their own “rituals” (and mine also include things like drawing guide lines on the sketchbook page I’ll be using etc..), these sorts of things can help you to get into the mood for creating things. 3) Purpose: One of the strange things that I noticed after I’d been painting or drawing whilst watching DVDs for a while is that, if I watch a DVD when I’m not painting something, I’ll sometimes feel like something’s missing. I’ll sometimes feel like I’m wasting my time. In other words, making art whilst watching DVDs can turn what is typically a fairly passive and “lazy” experience into something that feels a lot more productive. Plus, the incentive of watching a DVD can help you to feel motivated to keep up your art practice on the days when you are feeling less enthusiastic. 4) Inspiration: Watching a DVD in the background whilst making art can help you to feel more inspired in at least a couple of different ways. First of all, having a background distraction can be useful to take your mind off of any feelings of uninspiration for a few minutes. If you’re thinking about the story of the film or TV show you’re watching, then you’re less likely to be thinking things like “Oh god! What should I paint?!? !“, “I can’t think of anything! !” etc… And, as any creative person will tell you, these kinds of thoughts only make you feel more uninspired. Whilst you shouldn’t procrastinate for too long (see #1 on this list), a small amount of distraction can sometimes help to shake you out of an uninspired mood. Secondly, you can also take inspiration from the things that you’re watching too. Whilst you need to know how to take inspiration properly (and the difference between inspiration and plagiarism) before you do this, it can be surprisingly useful. In general, I’ve found that TV shows will sometimes give you a general direction that you can take your art in. Whilst you’ll still obviously have to work out a lot for yourself, having some hint of which genre you can use takes some of the uncertainty out of planning a painting or drawing. This is a reduced-size preview, the full-size painting will be posted here on the 15th July. And here’s a preview of what one of my paintings looked like when I watched season one of “Twin Peaks”, as you can see, it has more of a 1980s/90s kind of look – as well as some slight strangeness too. This is a reduced-size preview, the full-size painting will be posted here on the 13th August. So, watching DVDs whilst drawing or painting can help you try out different genres of art and, whilst it may not make you feel completely inspired, it will at least point you in a particular direction. Woo hoo! 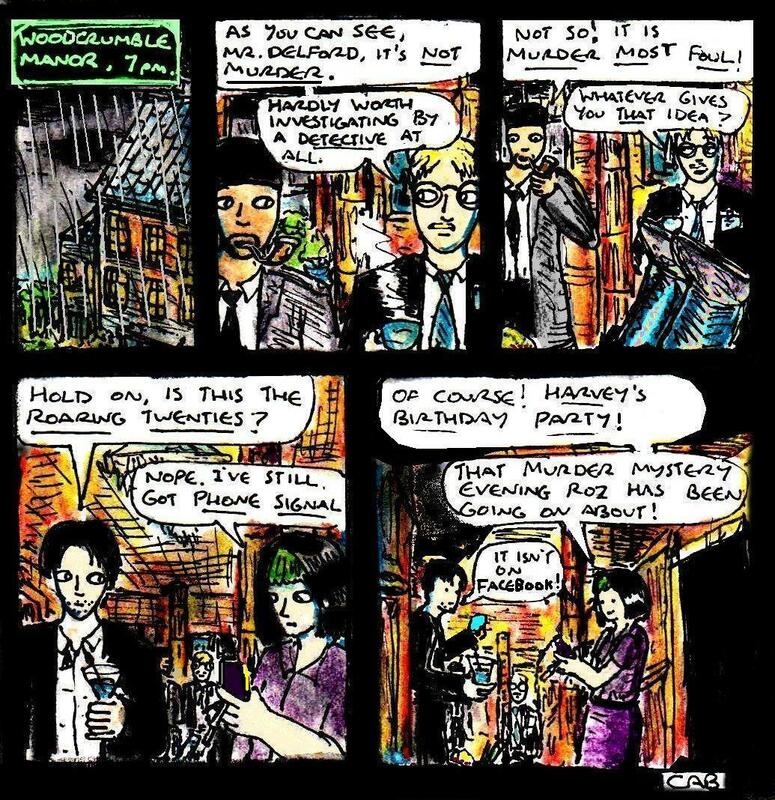 I am very proud to present the fourth instalment of “Damania Recovery” a (hopefully) six-part webcomic mini series, where Harvey gets to solve another case (albeit a traditional “cosy” mystery this time). If you’ve missed the previous parts, then they can be found here: Part One, Part Two, Part Three. Yes, interviews might work for Poirot, but it looks like Harvey is going to have to rely on good old-fashioned Sherlock Holmes -style deductions again. But, who did it? Well, stay tuned for the next episode tomorrow (and the final one the day afterwards). Although this is an article about creating historical art, historical comics, historical fiction etc…. I’m going to have to start by talking about real-life “anachronisms” and some vaguely geeky stuff. As usual, there’s a good reason for this. The night before I wrote this article, I happened to find an absolutely fascinating historical video online. This was one of those mildly unusual things that, like colour footage of 1920s London (or colour photos of 1910s Russia) or old footage from the 1920s/30s that seems to show people using mobile phones, seemed like an anachronism. But, what was it? It was a modern-style HD video of New York… filmed in 1993. Seriously, you can actually watch this in 1080p if you have a fast enough connection and/or enough available RAM. I watched it in 720p, but it was still pretty astonishing, given when it was filmed. Some of the high-definition scenes in the film look wonderfully retro and some look slightly eerie (eg: modern-style footage of the Twin Towers etc..), but a few scenes look like they could have been filmed today. For example, there’s some aerial filming which – if it wasn’t for a barely-noticeable helicopter shadow on a building– could easily be modern HD drone footage. Likewise, there’s a close-up of an old man sleeping on a bench, which literally looks like something from a modern HD documentary. So, what does any of this have to do with creativity? Well, one of the many interesting things about this modern-looking HD video from 1993 was the comments below it. One thing that seemed to “shock” a few people was the fact that nobody was staring at a smartphone in the footage of the busy streets. People were actually *gasp* acting like people whilst walking down the street. I was more distracted by the retro fashions etc… to notice this (which is especially odd, given that I made an entire webcomic about smartphones, time travel and 1990s America a while ago), but the absence of smartphones seemed to be one of the things that made it stand out as something from the 1990s. And, yet, it’s a really subtle thing. But, often the most telling signs that something ‘serious’ is set in the past are a lot more subtle. For starters, many things are surprisingly timeless. Although the inclusion of these things in historical works might make them seem ‘modern’, they’re often anything but modern. For example, the copious use of four-letter words in the fictional medieval-style setting of “Game Of Thrones” is probably closer to how people actually talked in medieval Britain (even if many written records of the time were kept by pious monks etc… who didn’t use four letter words). Even a few centuries later, the old French slang term for British people – “les godames” – comes from the fact that we used to use the word ‘goddamn’ a lot. So, it’s hardly a modern thing. Likewise, historical change isn’t really an instant thing – so, the best way to show that something is set in the past is often to focus on these timeless things and to keep the “old” details relatively subtle. This also reflects how nostalgia actually works. For example, in late 2016, I had a sudden and vivid moment of 1990s nostalgia that actually led to me spontaneously writing a short essay and making a cartoon. All of these old memories were suddenly brought back to life when I happened to hear about a videogame series that I played when I was a lot younger. It was a subtle “background detail”, but it probably evoked more nostalgia than a picture of the Power Rangers playing POGs whilst watching a Tamagotchi advert that was playing on a CRT television in the middle of an episode of “The Fresh Prince” probably would. So, yes, nostalgia and a sense of history can often work better when they’re fairly subtle.